Pizza is standard Friday night dinner at our home. 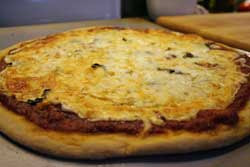 Homemade pizza is the best since there’s no fake cheese are artificial ingredients. If there are any leftovers, they freeze well wrapped in freezer paper. For our family of 7, takeout pizza typically costs $35 for 2 large pizzas and 2 side orders of fries. One time I estimated the cost of semi-homemade pizza to be $4.79 for 2 medium-sized pizzas. I think homemade pizza probably costs about the same. Imagine saving about $30 per week on take out food! This recipe makes 4 12-inch pizzas. I highly recommend playing around with the temperature of the water before adding it to the yeast. I found that heating the water in the microwave for one minute keeps the crust thin. Two minutes produces a thick crust. I typically use a KitchenAid mixer with a dough hook to mix up the dough since I’m making 4 pizzas total. If you think your mixer can’t handle the doubled recipe, then halve it and make 2 batches. Then, make another 2 batches for the freezer since the bowl and paddle are dirty anyway! Freezing homemade pizza dough and then defrosting it to make pizza also makes for a thin crust. I freeze mine wrapped in plastic wrap and stored in a gallon freezer bag. I bake my pizzas on aluminum cookie sheets. Sometimes I sprinkle cornmeal on the sheet after spraying it, and sometimes I don’t. Warm water in microwave for 1 minute, and then combine with yeast in a mixing bowl. Add the rest of the ingredients, except for the last one, and mix with the paddle attachment until the dough starts to pull away from the bowl. Using the dough hook and the additional flour, knead for 5 minutes. Divide dough into four sections, and shape each section into a ball. Shaping into a ball helps with rolling out mostly circular pizzas. Flour a surface, and roll out one ball. Put that onto a greased cookie sheet that has been dusted somewhat generously with corn meal. Roll out the rest of the balls accordingly. If you don't have four cookie sheets like moi, you can let the last two balls sit and then roll them out during the last five minutes of baking. Wipe olive oil lightly on the rolled out dough. Add your sauce of choice. Make sure that it is thick enough to hold up in the oven. Otherwise it will disappear into the dough. Bake at 450 degrees for about 17 to 20 minutes. Keep an eye on the pizza for the last few minutes since your oven may be cooler or warmer than mine. Connie, the squirrels have been wreaking havoc here! They missed the good crop of corn, but hit the peaches. Then they went after the raspberries a bit, and the pumpkins a lot, and probably the tomatoes.